A little bit of… what’s on the charts. She’s an actress, a dancer, a reality TV judge, and most importantly when it comes to this post, a singer. Coming off of debut single “If You Had My Love”, Lopez struck again with “Waiting”, taken from her 1999 album On The 6. Dancing her way to another success, the song landed at #8 on the Hot 100 later that year and also charted well internationally. Lopez is back judging on American Idol this season. The duo of Darren Hayes and Daniel Jones based out of Brisbane, Australia, racked up some major hits beginning in 1997 with “I Want You”. This big ballad was their last #1, spending four weeks atop the Hot 100 and five weeks leading the CHR airplay chart. It would also rank as the top song on my chart in December. The duo broke up in 2001, but Hayes has been charting solo on my top 40 since 2002. Mark McGrath and the boys from Newport Beach, CA, dominated the charts earlier that year with an Alternative and CHR radio smash, “Every Morning”, and this third single from 14:59 also provided a bit of airtime for them. Paired with a black-and-white video set on the beach, it had that perfect summer and early fall vibe. The group last made my chart in the summer of 2005 with “Shot Of Laughter”. Don’t you love those compositions from the confectionery? Moore was always one of the lessers in the Pop Princess Class of ’99 (with Britney Spears, Christina Aguilera and Jessica Simpson) but I liked her music, both as a pop act and singer-songwriter. She’s since publicly come out and trashed her first few albums. Still, we treasure that precious message of I’ll be forever yours, love always, Mandy. From The Mickey Mouse Club to the Dance/Club Play charts, Aguilera is a superstar. She charted on the Adult Contemporary chart a year prior with “Reflection”, from the Disney movie Mulan, but “Genie” really put her on the map. Released in early summer, it was all over the radio by the fall and helped her self-titled debut album to sell over 9 million copies in the U.S. alone. It was my first official #1 in September. STOP! The needle spun out of the groove for a hot second, but then it was back to a poppin’ party hit for Spears, the third in a row from her …Baby One More Time album. It was also featured in the movie Drive Me Crazy, starring Melissa Joan Hart and Adrian Grenier. “Crazy” would spend one week at #1 on my chart in November. Spears is currently promoting a new album, Britney Jean, due December 3. From their album You Can’t Stop the Bum Rush (what a title) comes this lone hit of the band’s career, led by siblings Marc and Sharon Costanzo. It’s a great summer song and became a top ten hit in many countries, including Australia, the United Kingdom, the United States, and in the band’s native Canada, where “Steal” went to #1. They reunited in 2012 and released an album together; however, it did not chart. Someone might have been glued to the TV when this music video came on Total Request Live, though I’m afraid I never quite learned the dance sequence. It was one of the most expensive clips in history, but it served its purpose. “Larger” was another big top ten radio single for the Boys, and would replace the song at #1 on this chart in two weeks. Parent album Millenium went 13x Platinum. Robot suit not included. Everyone and their mother wanted a copy of Supernatural in 1999, leading to one of the greatest comebacks in pop music history for Santana. “Smooth” was one of the reasons for that, a huge #1 airplay and sales hit that you could not escape for some time. On my chart, it only went to #2. Shock, horror! Three years later, “The Game Of Love”, featuring Michelle Branch, went to #1 on my survey for three weeks. German-born David Lubega was just 24-years-old when he conquered the global music surveys with his infectious anthem, a remake of an old Pérez Prado instrumental from 50 years prior. 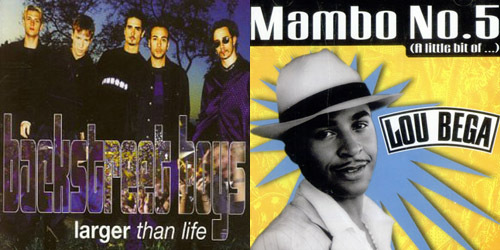 “Mambo” would end up with a total of eight weeks at #1, this being his fifth, and would stay on through the spring of 2000. Followup single “Tricky Tricky” would also go top ten, and that would mark the end of his career on my top 40. He’s still active in his native country, releasing A Little Bit Of 80’s, a covers album, this past June.